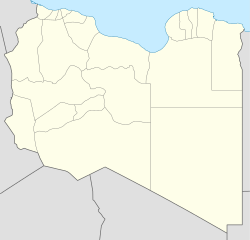 Qasr Libya or Theodoureas (Arabic: قصر ليبيا‎) is a small town in northern Libya about 66 kilometres (41 mi) northwest of Bayda. In ancient times, it was called Olbia and Theodorias, the ruins of which were excavated in the 1950s. The town contains a museum with fifty Byzantine mosaics. It's on the cross-roads between the eastwards Marj–Bayda main road, and the southwards Qasr Libya–Marawa road. ^ Amraja M. el Khajkhaj, "Noumou al Mudon as Sagheera fi Libia", Dar as Saqia, Benghazi-2008, p. 121. Wikimedia Commons has media related to Qasr Libya.